Immerse yourself in the tranquility and natural beauty on the island of Gozo at this luxury farmhouse , where charm and hospitality meet comfort and fine cuisine. Ferrieha is widely considered the best B&B on the island. We are uniquely situated At just 1 KM from Mgarr Port in Gozo ( 5 minutes away by bus from the ferry ) to the town of Qala, which is a perfect vantage point to explore the island. 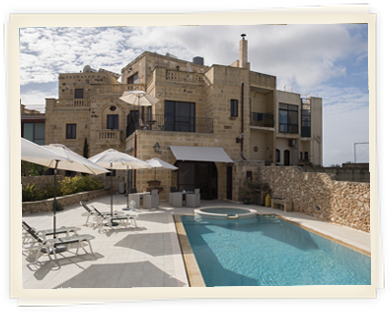 The B&B is located close to Gozo’s best beaches and features an unique stunning view of Comino’s Blue Lagoon. Qala itelf is lively throughout the year and is home to several restaurants and bars in the picturesque central square ( St. Joseph Square ) . Mere steps away at Ferrieha, you’ll fine absolute peace and tranquility. While there’s plenty to explore on Gozo and the surrounding islands, many guests are content to relax poolside or on the surrounding grounds. Breakfast, snacks and cocktails are available on the premises, as well as pre-organized dinners.